​At the Casa Colina Hospital's Tribute to Courage Event in February of 2017. The Artist used actual Coffee, Chocolate and Gold Leaf gold carat in the Signature Work of Art presented on stage. A total of (4) works of art were unveiled, Mrs Ali-Conway has a previous Work in the collection by Artist presented at the VIP Reception. The living Two Sugars, Sugar Ray Leonard and Sugar Shane Mosley are featured in another unveiling by artist! PRESS: FIGHT HUB TV - Sport Work of Art Unveiling of Sugar Ray Leonard & Sugar Shane Mosley. 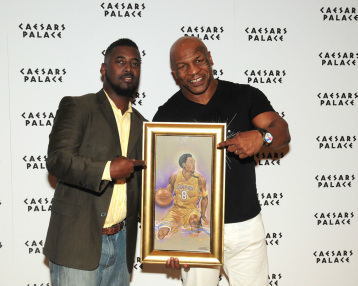 Tyson & Artist with Art of Kobe in Support of his return. In 2015, Artist John Barge III unveiled a work of art created that he created 13 years ago and presented to the Iconic Heavyweight World Boxing Champion and Hall of Famer 'Mike Tyson' @ CAESAR'S PALACE in Las Vegas, Nevada. 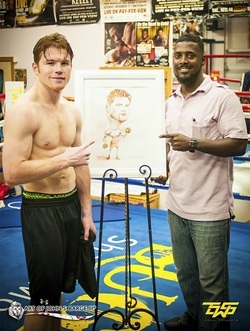 Sugar Shane Mosley, Art Collector of John's Art were on hand to support the Artist. 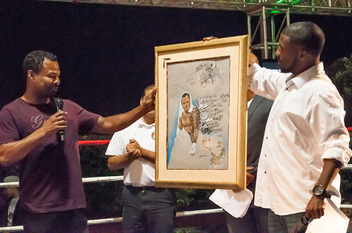 Mike Tyson was in amazement as he receives his "1st Archival Custom Print." He (Tyson) signed the Artist's original art created by the Artist. 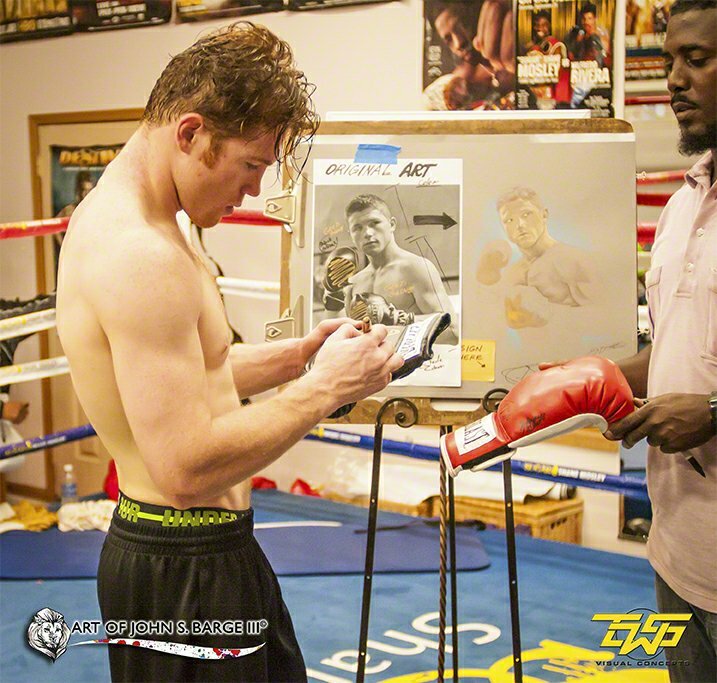 Iron Mike owns the 'first-ever' Custom Photo Archival of the Work of Art called "TYSON ICONIC." 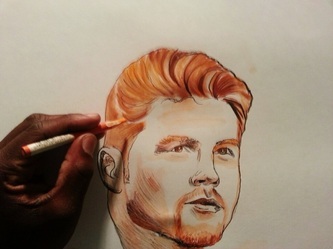 John Barge has created several Original Works of Art of World Champion CANELO "SAUL CANELO ALVAREZ in the Ring. The former WBC, WBA, and Ring Magazine Light Middleweight World Champion. 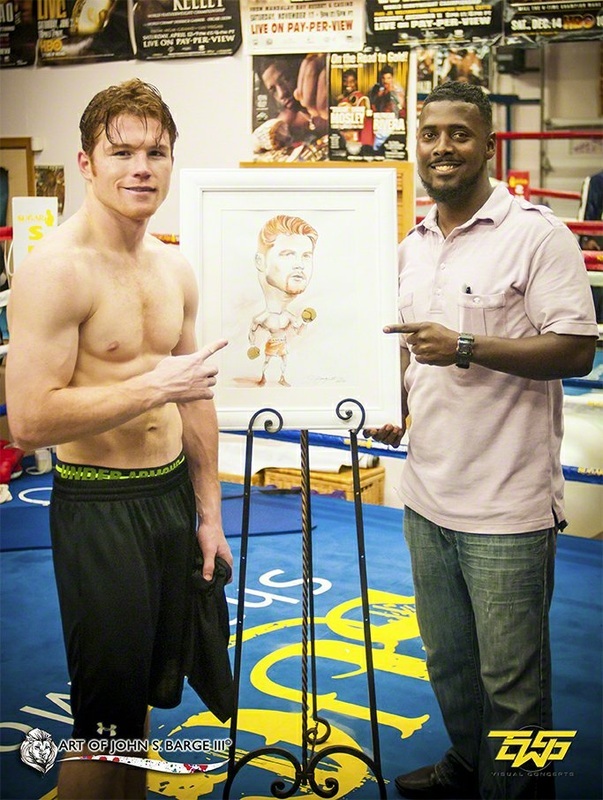 He is promoted by Oscar De La Hoya's Golden Boy Promotions in the Ring seen here with his Caricature Drawing of him. 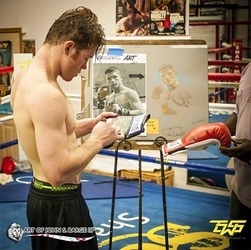 He practiced/sparred with the Boxers of Sugar Shane Mosley's Boxing Club in Big Bear Lake in Big Bear, California for his highest paif match against multiple World Champion Floyd Mayweather Jr. This Work of Art seen here with Saul is one of (2) Originals. Artist's and Artist Representation gives 'Special Thanks' to 8-Time World Champion, Current WBO Champion Sugar Shane Mosley, and Mosley Boxing Club, and the Alaverz Camp for this special opportunity. Art Collection - "The Art of FIGHT! 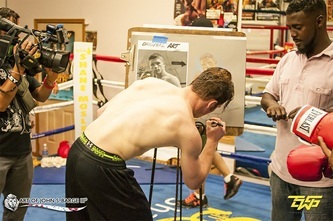 (c) - Signature Series: "Boxing Dogma"
"KO Cancer" - Boxing for the Cure,", a (2) Day event hosted by Sugar Shane Mosley Promotions, John was the 2012 Official Artist on Exhibition throughout the (2) day Event, Sugar Shane Mosley's first-ever US Boxing Commission Sanctioned Amateur & Professional Men's & Women's Boxing Event in Pomona, Ca. Artist also Presented a "Surprise Unveiling Work of Art" of Legendary Hall of Famer Sugar Ray Leonard in the Boxing Right during the Intermission of the "Amateur Fight" portion. 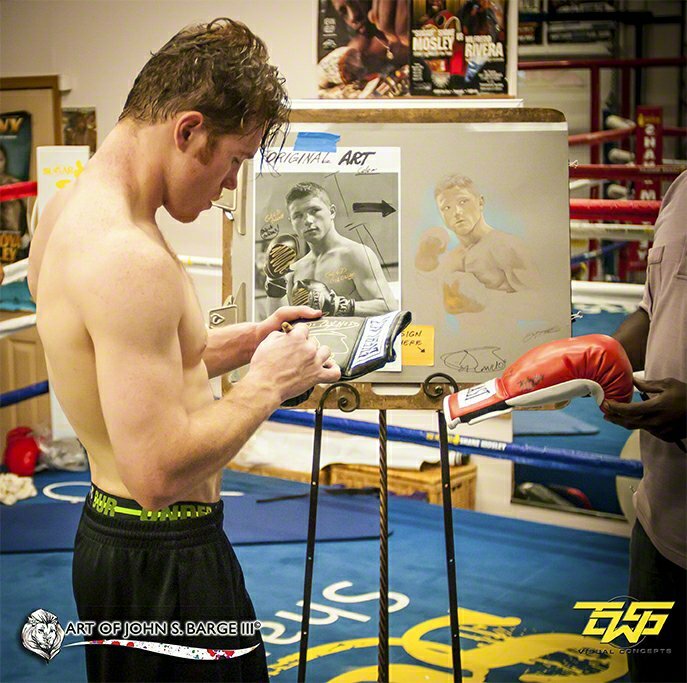 The Artist's special "Signature Series" called "BOXING DOGMA is under the umbrella of the "The Art of Fight! (C)" an Art Collection created by Artist John Barge III, of the Sport Art of Boxing in a Commemorative Sport Works of Art of is a Commemorative focus on the History of skilled fighting from the Original Bare-knuckle boxing to the Modern Sport of Boxing, includes "Kickboxing," to the variant skilled fighter's new sport of Mixed Martial Arts coined "MMA." 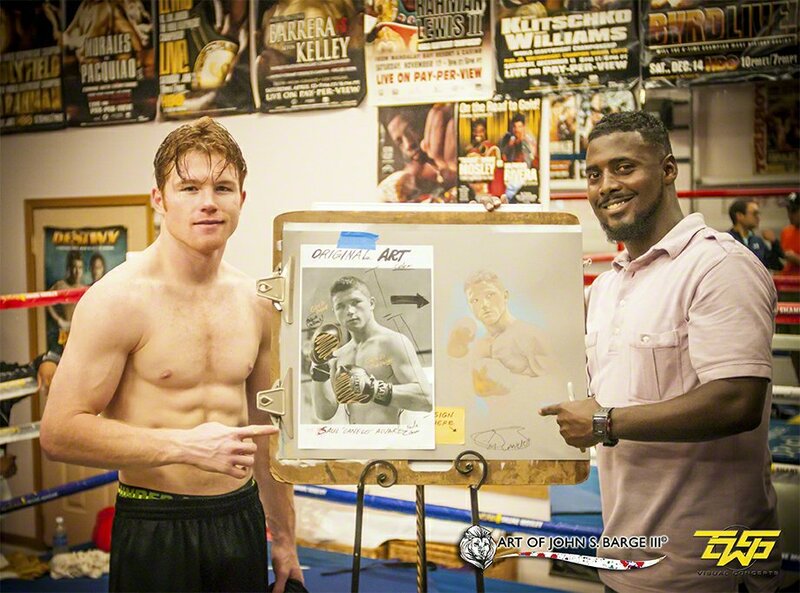 The Artist's first ORIGINAL WORK OF ART UNVEILINGS were funded through local businesses, groups, and individual persons that were FIGHT FANS of the Sport. 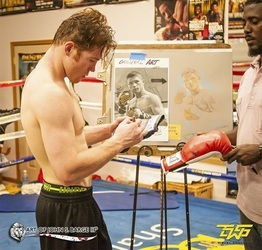 Artist inscribed the featured "Company Names" on the actual Work of Art, it started at the MGM Grand -Las Vegas with Custom works of Art of World Champions, future hall of famers, trainers, pro & amateur boxers in the Sport. The Most Popular to date is Sugar Shane Mosley and Floyd Mayweather Jr.'s "PRE-FIGHT SOCIAL AFFAIR @ MGM Grand in Las Vegas, NV benefiting their Foundations. Artist's current Present Commission is for 8-Time World Champion, Manny Pacquaio from the Commissioned by the Filipino and American Bully Breed Canine Community presented to Mr. "Pac-Man" Pacquaio. Artist has plans to continue a short tour in the US and Abroad. Artist's new creative Work of Art was done in a stylized Post Abstract Expressionistic painting influenced by American Painter, Icon Jackson Pollock's "Number 8" Painting, this one of (2) created works from the M.O.O.F. Art Series (other is "MOOF II") this style was a free-style, random, quick, and fluid brush stokes. Artist had never done before, took 2 days to complete a roughly two 5 hours sessions, This huge 4 ft X 8ft Wooden Panel was actually transported to Administration office, the wooden panel had been in possession of Executive Director of the ICPA for a while. Artist quickly painted the unfinished work in the latter 5 hours before a LIVE ART and LIVE AUDIENCE in the main Studio prior to his LIVE ART Session drawing for "For Colored Girls." 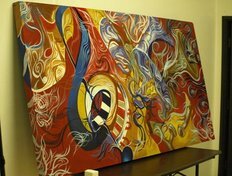 The rate of speed at which the Artist painted the LIVE PIECE was attributed to the Jazz Music compilation by Executive Director of the ICPA, Marcus Coleman.